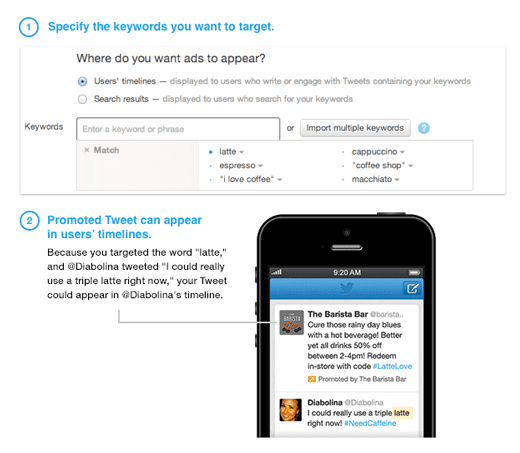 Twitter has offered interest-based advertising for some time, but we’re notifying this is a big deal since from today it offers targeting based on intent shown by keywords in a similar way to Google AdWords. The way this works is that when someone tweets and it contains a targeted keyword, a promoted tweet can be delivered as this example of a request for a coffee coupon shows! BrandRepublic reports that several companies looking to drive awareness and transactions have used the approach including Everything Everywhere (@EE), MicrosoftJapan(@SurfaceJP), Walgreens (@Walgreens) and GoPro (@GoPro). For GoPro, which offers wearable and gear-mountable cameras, engagement rates as high as 11% were seen and more than two million impressions after testing keyword targeting in timelines across four marketing campaigns. This advertising is not Google-like in that it is still for larger advertisers since a minimum spend of $5000 is required and it’s currently only available through the API. It’s unlikely Twitter will grow significant ad revenue without offering the platform for smaller advertisers like all the other social platforms and search engines. It’s understandable it wants to prevent Spam so advertising is only through account managed relationships which add to the cost for advertisers. As otherwise it would backfire and hurt us all the long run as twitter streams could become interrupted and clogged with ads? The next question is will Twitter in it’s wisdom offer a premium priced ad free service, or, claim the inevitable ‘relevant ads add value to timelines’? This entry was posted in great marketing, greatmarketing, marketing, mobile marketing, Uncategorized and tagged greatmarketing, twitter, twitter ads by Dan 'Great Marketing Works' Sodergren. Bookmark the permalink.